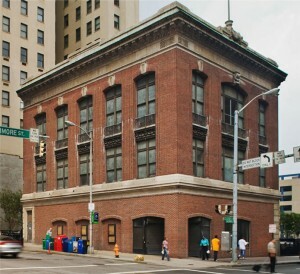 Built to house the Baltimore branch offices of the Pennsylvania Railroad Company, this structure at 200 East Baltimore Street was an early commission of the architectural firm of Parker & Thomas (later Parker, Thomas & Rice), the pre-eminent architects of Baltimore’s Beaux-arts commercial & financial structures of the first quarter of the twentieth century. Currently vacant, the building occupies a site in an area undergoing intensive redevelopment. Adjacent buildings were recently demolished for a surface parking lot, and the Pennsylvania Railroad Building has been considered recently for demolition as well. The building lies within the boundaries of the Business & Government National Register Historic District, and it was featured in the Built to Last exhibit at the Maryland Historical Society in 2002. The three-story brick building, which occupies a corner site on one of Baltimore’s most historically significant commercial intersections, complements the nearby Alex. Brown & Sons Company building in both style and scale and reflects the architectural trends in Baltimore’s business and financial center following the Great Fire of February 7-8, 1904. The building’s completion by July 1905 indicates the rapidity with which the Pennsylvania Railroad and the city’s other business institutions rebuilt in the area, thus maintaining their association with the part of the city that had functioned as its financial and commercial heart since the eighteenth century.